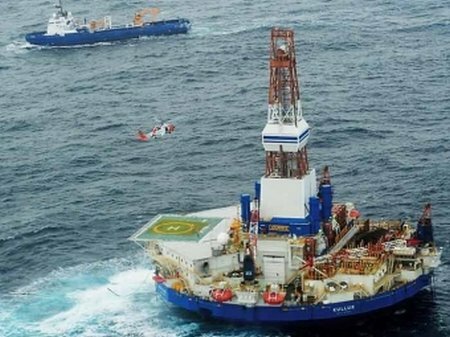 May 29, 2015—Owned by Shell Offshore, Inc., and operated by Noble Drilling, the Kulluk grounded in heavy weather near Ocean Bay on the eastern coast of Sitkalidak Island off Kodiak Island, Alaska on December 31, 2012. At the time of the grounding the Kulluk was under tow by the ice-class anchor-handling tow supply vessel Aiviq, owned by Edison Chouest Offshore group member Offshore Service Vessels. Mississippi Governor Phil Bryant visited Huntington Ingalls Industries’ Ingalls Shipbuilding division’s Pascagoula, MS, shipyard yesterday for the ceremonial signing of a $20 million bond bill supporting Ingalls’ “Shipyard of the Future” project. The USS Arizona Memorial remained closed to visitors today as repair work continued on the floating dock used by boat tour groups to access the Memorial. Ocean Falcon will provide emergency recovery, rescue cover, tanker assistance and general field support for offshore operations at the Curlew Field. The new company supports the full portfolio of Raytheon Anschütz’s navigation components and solutions for both new ships and retrofit projects.